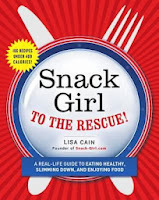 From Goodreads ~ From popular blogger Lisa Cain, aka "Snack Girl," a common-sense guide to healthier eating and weight loss, including 100 Weight Watchers-friendly recipes. Since 2009, Lisa Cain has been blogging at Snack-Girl.com about how to make healthy changes in your diet and lifestyle. 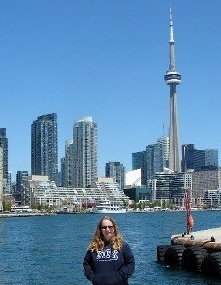 Her mission is to share the secrets and recipes that have helped her stay fit and healthy, without sacrificing fun or flavor. 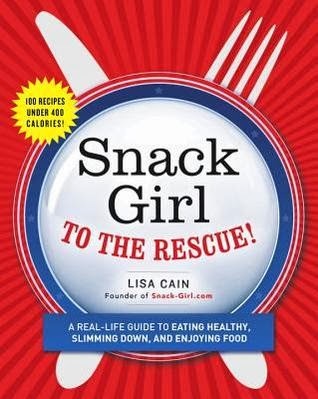 Snack Girl to the Rescue contains Lisa's best advice on avoiding common weight-loss pitfalls, shopping healthier on a budget and getting in shape, along with 100 recipes for fun, quick, and affordable meals and snacks. Written in Snack Girl's signature voice - down to earth, encouraging, and funny - this is the go-to resource for anyone looking to incorporate healthier food choices into their lives, whether they are looking to lose weight, have more energy, or just feel more confident about their family's nutrition. I like reading books about getting healthy and this one caught my eye. Healthy weight and healthy image - various diets, weight loss pills, prepackaged foods/shakes/cleanses, journaling, etc. Healthy cooking - utensils, costs, supermarket versus organic, getting your family to eat healthy, etc. Food marketing - packaging, buzz words, processing, labels, etc. The second part are recipes. I tend to be fairly fussy and found that most of them looked easy to make and delicious. I've read lots of books on getting healthy and really enjoyed this one. I didn't learn anything new but it was a great reminder that it's not that hard to get back/stay on track. I liked the writing style. A lot of these types of books are written by doctors and nutritionists ... while the information is solid, the writing tends to be scientific and serious. This book isn't like that at all ... there was lots of great information and it had a conversational manner as if the author was chatting with me. The author is a mom of two and keeps that in mind as she discusses her strategies ... she doesn't have the time to make anything fancy. In fact, she doesn't really enjoy cooking but she wants ensure that her family eats healthy most of the time. The ingredients she uses aren't expensive and are things you probably have in your kitchen anyway. I'd never heard of Snack Girl but I've since added her link to my blog list. Hey, I'll take all the tips I can get!! Thanks so much for the great review! I hope you take the time to try some of the recipes.